Starting out from the colourful Bavarian city of Passau, flat, easy going cycle paths lead you through to the famous Schlögener Loop, the charming city of Linz and mouth-watering sweet pastries of Vienna. From Vienna, rolling countryside brings cyclist to the enchanting Slovakian capital of Bratislava. Continuing to roll with the bends of the Blue Danube, fairy-tale castles pepper the riverbanks as you pedal to Budapest, the city where Eastern meets Western Europe. Famed for its abundance of spa’s and steam rooms it’s the perfect pamper to end your Danube adventure. If you have time to spare before picking up you hire bike (between 4-7pm), the historic Bavarian city is a delight to explore. The Old Town was created by Italian baroque masters in the 17th century and reveals soaring towers, picturesque palaces and promenades and romantic lanes. At the heart of the old town is the Cathedral of St Stephen, which boasts the world’s largest cathedral organ. Passau has direct train connections to Salzburg, Munich (2.5h) and Vienna (3.5h), which are the most convenient airports. Late arrivers can pick up their hire bike this morning. 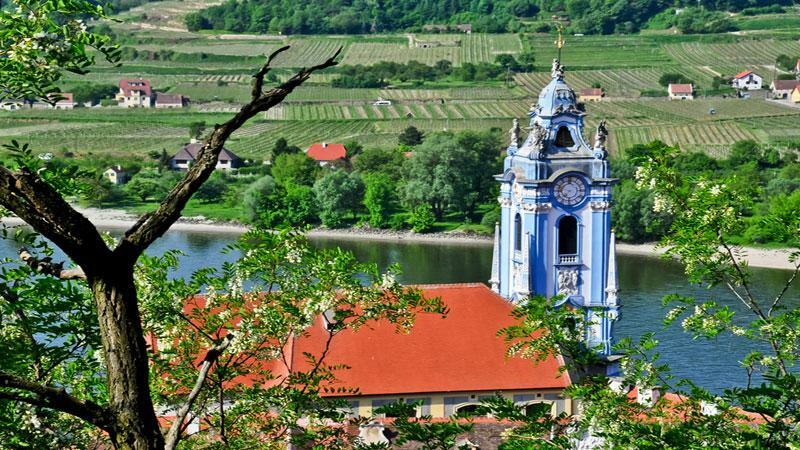 Then it’s off for today’s delightfully flat and traffic-free route along the scenic River Danube Cycle Path visiting several fascinating attractions, including a Trappist monastery at Engelhartszell, where cordials and liqueurs boast "special healing powers". Next up it's the Schlögener Loop, where the river makes a dramatic about-turn of 180 degrees. You’ll leave the impressive Schlögener Loop behind and continue the easy-going route through the fertile and picturesque Eferdinger basin. The valley is wider here and you’ll pass numerous ferries and boats as they sail the Danube, while you go by pedal power. The destination is Linz, the capital of Upper Austria, where you can make the most of a summer’s evening with a stroll through the enchanting old town. Today’s cycling heads along the Danube and though a breath-taking scenery of lush meadows. Cycle to Mauthausen to view a row of 17th century houses decorated with striking murals. Further along, the Celtic village of Mitterkirchen offers a fascinating insight into how people lived some 2,700 years ago. The final destination today is Grein, which is home to Austria's oldest city theatre and the magnificent Castle of Grein. Today’s scenery is remarkable for its diversity. 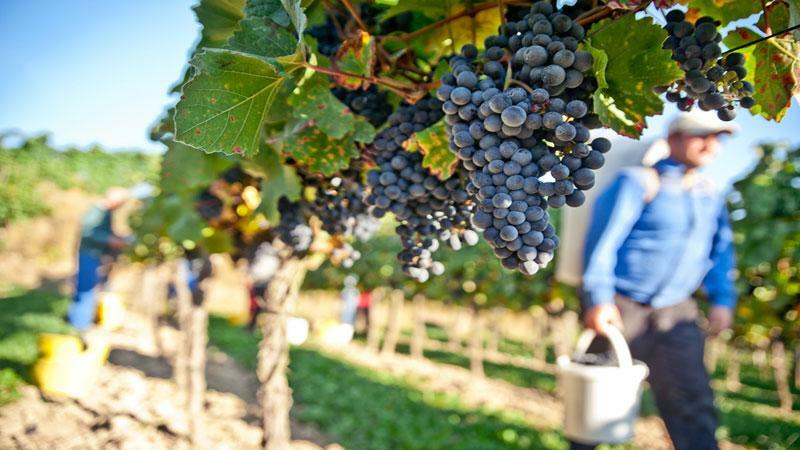 The narrow Strudengau valley gives way to a wider landscape from the attractive town of Persenbeug, and then to the Wachau valley, which is characterised by terraced vineyards and fruit orchards. 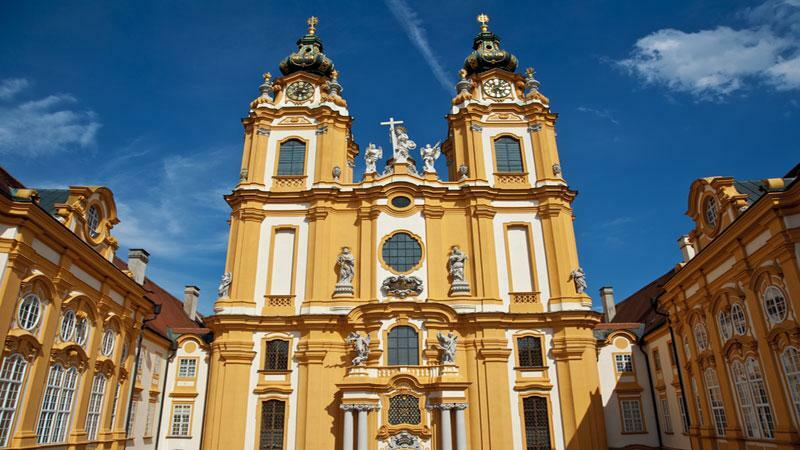 At Melk you will revel in the sight of a gorgeous baroque Benedictine monastery. 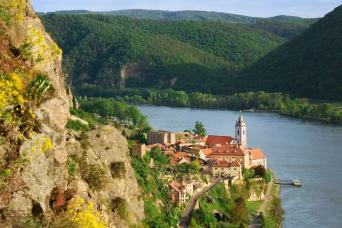 More delights are in store today in the beautiful Wachau valley, where you will rarely be without the sight of a castle, palace or monastery. The route winds its way to Krems, with the chance to stop off at the pretty winery villages of Spitz, Weissenkirchen and Durnstein. If there’s a must-do on this tour it’s popping into one of the quaint taverns for a glass or two of the local wine and a warm Austrian welcome. You’ll take the train to Tulln, which is famous for its beautiful market gardens and Art Nouveau painter Egon Schiele, and then cycle through the fabulous Vienna Woods (Wiener Wald). As you cycle towards Vienna, the City of Music, it’s worth taking the time to visit the impressive monastery in Klosterneuburg. Today’s theme is peace and relaxation, although you will still be cycling for a few hours! Not far from Vienna you’ll discover an off-the-beaten-track landscape and a Nature Reserve boasting a stunning and diverse collection of flora and fauna. This is you chance to revel in the wonderful peace and tranquility of the region. At the town of Bad Deutsch Altenburg, the Archaeological Park of Carnuntum awaits, offering a fascinating journey back to ancient Roman times. 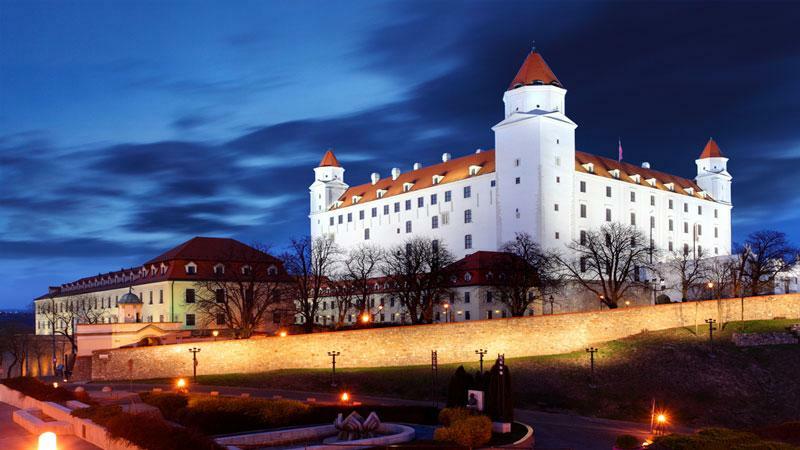 Today takes you on a short but scenic train transfer after which you’ll cycle on to the city of Bratislava, the capital of Slovakia and Europe’s youngest capital city. Located between the Danube plains, hills and vineyards, Bratislava enchants with its dreamy old quarter and walled castle. The wild and untouched land and waterscape of the Szigetköz is an idyllic paradise for birds and fish. 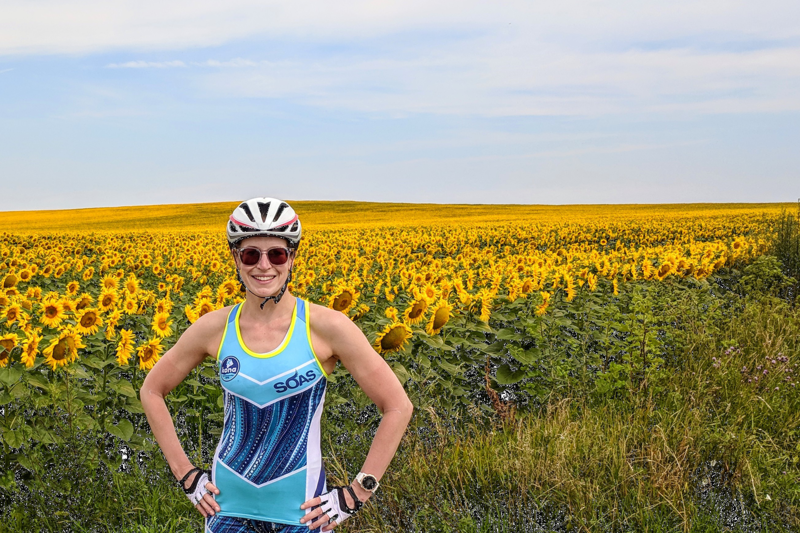 Cycling from Bratislava, you will relish the tranquility and the stunning scenery encompassing 500 tiny islands boasting numerous farming villages and a labyrinth of countless Danube creeks. A train journey takes you to Györ, with its beautiful Baroque-style old town. The magical scenery and quaint villages accompany you on your cycle today, first along the banks of the Slovakian Danube and then via small, quiet roads. On your way to Esztergom – known as Hungarian Rome and the Town of Bishops and Kings – you’ll pass the impressive Roman fort of Kelemantia. Another highlight is the magnificent Hungarian Danube Bend located just past Esztergom. Acclaimed as one of the most beautiful sections of the Danube, the river here winds through the Visegrad mountains and then makes an abrupt turn south between Esztergom and Szentendre. In the Basilica of Esztergom you’ll find Hungary’s largest Catholic church and all kinds of attractions to explore. Depending on your onward travel plans, you may like to further explore Budapest or even spend an extra night or two relaxing in one of the spa's or visitng one of the many castle's of fortresses. 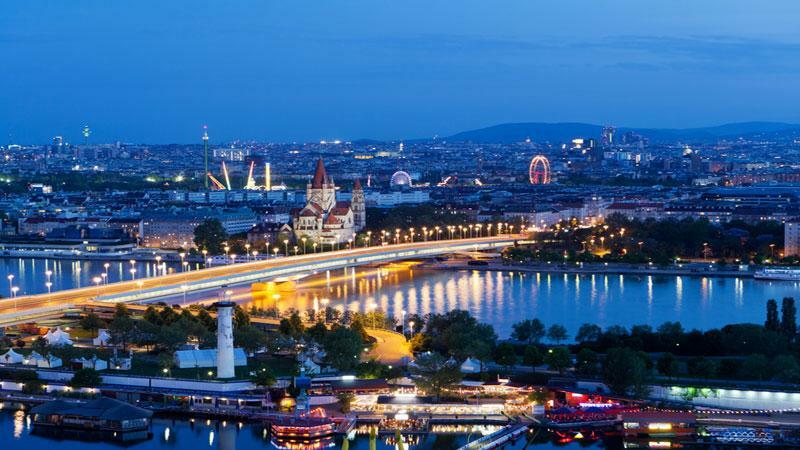 If you have the time, why not spend an extra night in Vienna or Budapest and enjoy exploring more of the cities’ hotspots? After all, no one wants their holiday to come to an end, do they? Our Danube Cycle Path trip includes accommodation in standard en-suite double/twin rooms in typical Austrian Inns which are 3* standard. We carefully select them for their warmth of welcome and character. Occasionally if a hotel is not available in the location specified you will be accommodated in a hotel of the same or better standard in the surrounding area. Each days distance is approximate as the distance will depend on the location of your hotel. This trip is available to solo cyclists and is perfect as the route is popular so there are plenty of people to chat with every day. There is a supplement as some costs aren’t shared. This tour is available on a number of Saturdays, Sundays and Mondays from April through to October. confirmed at the time of booking. Please note that the Ice Hockey World Championship is on from 10 to 26 May in the Slovakian host city of Bratislava. This may cause the area to be more busy than usual and accommodations may have limited availability over this period. an information pack for your trip. of the rental package but your own is likely to be a better fit. If you would prefer to bring your own bicycle please ensure it is thoroughly serviced and is an appropriate bike for this trip. It is a requirement of booking this tour with Macs Bike that you have suitable Travel Insurance which covers you for the activity, emergency evacuation and hospital care. Passau is located in Germany close to the Austrian border. It is easily accessible with direct train connections to four major airports. Linz (1h30) with Ryanair, Salzburg (2h45) with Ryanair & BA, Munich (2.5h) with Lufthansa, BA, Monarch & easyJet, and Vienna (3.5h) with easyJet, BA & Austrian Airlines. Please see www.oebb.at for train times & prices. Budapest Airport is served by a number of scheduled and low-cost airlines connecting through to most major international cities. If you need to return to Passau this can be booked at an extra cost for you. This is a combination of bus travel to Vienna and train travel to Passau. Return travel from Budapest to Passau. This trip is graded easy as the route is almost entirely flat, with a big hill on the final day. Daily distances are on average between 40 and 60 km so you will need to have a basic level of fitness and we advise some training before the trip. Linz, Salzburg & Munich are the closest airports and all connect by train to Passau. Vienna is also an option. We suggest you book as soon as your plans are finalised as this trip is extremely popular especially during peak season from July to August. Your bags will be transferred from your accommodation as per your itinerary and moved onto your next overnight accommodation. We ask that you limit your luggage to one bag of up to 20kg per person. Public transport and taxis are available, if you are need of support please ask the hotel reception staff for local travel advice. Otherwise, please do contact our local partners who will be more than happy to help. Great trip. Well organized. Some of the hotels were a bit away from center but that was not a major problem. Also, hotels not always easy to find. Rest of route is well marked by maps supplied and by signs on the way. Luggage always at next hotel. Easy cycling along the Danube, plenty of cafes and interesting sights to fill the day and relax. Hotels in the the towns tended to be on the edge of town, so you had to cycle into town, but a couplle were right on the river side. Generally, th hotels where clean and well run but a bit dated decore and only a couple had air conditioning. The bikes are okay, a bit heavy but no hills so fine. 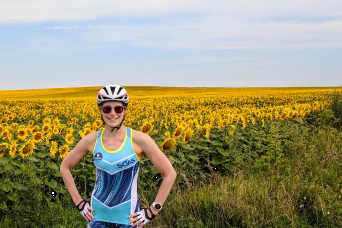 I was particularly impressed that my wife thoroughly enjoyed the cycling trip. I think she was a bit skeptical when I suggested it. But we both had a great time. Met many very nice people along the way. The support worked perfectly. Bags were always there. The hotels were all very good. My wife is particular about hotels and she was happy with every one of them. All were very clean. We are already thinking about doing another cycling tour next year. 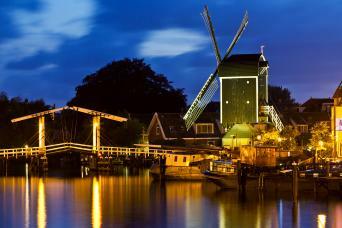 This is a great trip, with some superb scenery, great food/wine/beer, and excellent accomodations. You need to be mindful, though, that unlike one-week packages, the focus is definitley more on biking. Many days, the distances are longer than the guide indicates, often 60 kms plus. The Passau-Vienna portion is more scenic and is definitely easier as the bike paths are in excellent condition, paved, and manly flat with great signage. The Vienna - Budapest section has several areas of high winds, (as evidenced by the hundreds of wind turbines), which made for some challenging, exhausting days. As well, bike paths are not as well developed, and include some very rough sections, and some days were not visually entertaining. Accomodations were generally excellent, though a couple were pretty basic. Breakfasts were a highlight every morning, with a huge variety of healthy, fresh options. The quality of the bikes was a nice surprise and the guidebooks, maps and information were great. We found the people at MACS were very quick to reply to emails, and their company on the ground, Rad & Reisen, gave excellent support enroute with prompt luggage transfer. We were glad to have brought proper biking clothing with options for temperature variations, wind and rain, and would highly suggest bringing your own gel seat and helmet. 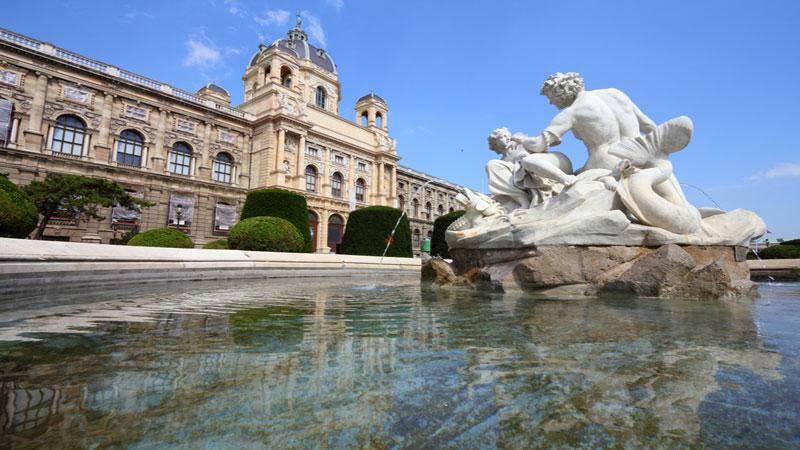 Would also suggest spending an extra day in Vienna, halfway through your trip, to rest. With easy-going cycling, fascinating cultural and historic sites, as well as stunning scenery, the Danube cycle path is perfect for experienced cyclists, beginners, and active families looking for two weeks on two wheels! Cycling on mostly flat dedicated cycle ways, the latter half of the trip will give way to some hills. With plenty of opportunities to sample local dishes and admire centuries old towns, every pedal stroke is completed in your own time.